As ever, over to Galanthil for the review! Sweden has had a fairly rapid progression. Finishing 8th for their first participation, they never fell under 9th place, and have always sailed between the 5 and 9th positions. To find them in the 6th position of this classification seems very coherent. It’s up to them to prove and continue this momentum this year. As we approach closer and closer the 200 NAF average, we can note that Sweden brings a very solid group (person below 170 ranking, a Top 1 on a roster and a total of 19 selections, without a rookie). The captain, and the best NAF ranked, this player will celebrate his 6th participation in the Eurobowl, an ever-present for Sweden in the competition. 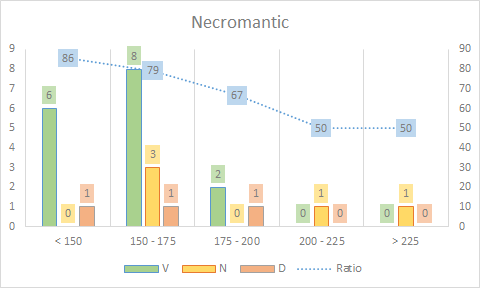 After the first 3 time playing Necromantic, he played 2 editions since the World Cup, Dwarf (4/5/3), to finally take control of his roster, for first place in the world with Necromantic. 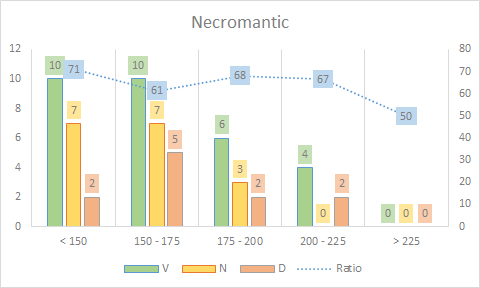 During his 3 Eurobowls having played Necromantic they come out a completely neutral balance sheet (6v / 6n / 6d, or 50% ratio). 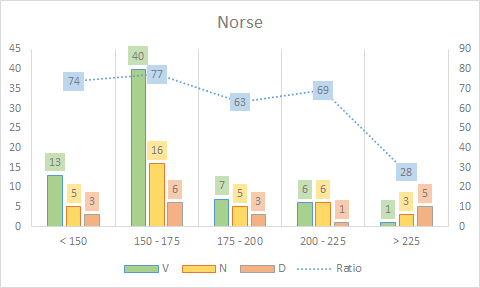 In total, he is on 45/17/24 (62.21 ratio), and we can see on his chart that despite a drop in opponents between 175 and 200 ranking, his Necromantic behave rather well when facing top players, since he is positive about coaches over 200 NAF. His team should be able to count on the leadership and experience of their captain to get a good performance at the end of the tournament. We stay in the experienced with Ozt, who will play his 5th Eurobowl in Cardiff. After a first edition at the head of the Orcs … inconclusive … (0/5/2), he took the reins of the Nordic with much more success. To date, he has released a 9/4/5 (61.11 ratio) record on his holdings on this roster. In total, we note that it is very solid up to 225 ranking opponents. However, in his meetings against opponents of very high level (> 225), he won only one game out of 8. His team will rely on his level of play to climb the ranks of the rankings. It’s up to him to raise his level of play in the money time by looking for results against the very big players that he will probably come across this weekend. Without being as experienced as his 2 previous compatriots, the 3rd and last coach of this selection to exceed 200 NAF on his roster will play his 3rd Eurobowl, having participated in 2016 and 2017. 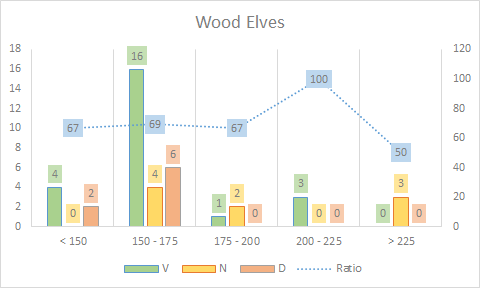 He always played Elves (Dark in 2017 for a score of 2/3/1, and Wood the previous year). Cumulative, from the top of its 218 ranking NAF, it displays a balance of 24v / 9n / 8d (69.51 ratio). It will be, at the head of a roster on which it is important to capitalize, certainly one of the main drivers of the group. We also note that Skuld is simply undefeated so far against opponents over 175 NAF! Of course he also did not beat players over 225, but it will take this player very seriously! A single Eurobowl already played for Lockmund, who will reign his elves a second time. This coach seems to be a regular with so-called “Tier 2” rosters, or worse. 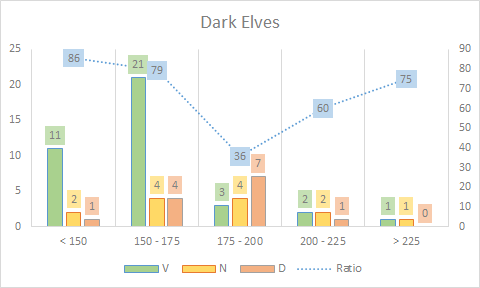 Nearly 70 games in Vampires, 35 in Khemris and finally 36 in Pro Elves, the 3 rosters he plays the most. 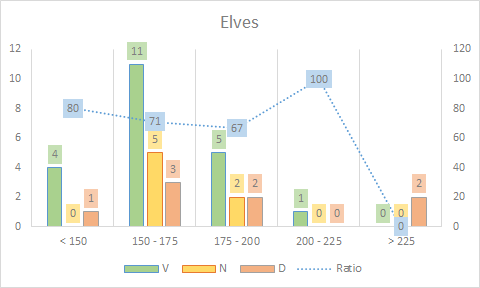 In 2017 he finished on a balance sheet of 2v / 3n / 1d, and we realize that cumulatively, in Elves, he lost very little (21/7/8, for 68.06 ratio) and that he will have to rely on him. His record against coaches over 200 is not very telling since he crossed paths with them little, but from 175 to 200 already, the trend shows that it is very solid. And it is very useful to have such a strong player on a secondary roster, as that will help to control the team results as they push for wins. Second Eurobowl for Pellevin, as well as Lockmund. Last year at the head of necromantic (2/1/3), he will play Humans this year. Although he has fewer games played and therefore experience at the head of this roster with orcs or necromantic, he is not far from being his best roster in terms of ranking. If it comes out an overall balance of 24/10/10, we note that it has little benchmark against the best. He has never faced players over 200 with his humans. We will see in a few days now if this apparent lack of experience will hurt him. Third Eurobowl and 3rd different roster played for Pidpad. At the controls, respectively, Darl Elves (2/2/2) and Necromantic (2/2/2) in 2016 and 2017, he will coach the Undead in Cardiff. Not enough experience on this roster for this player, who has played “only” 21 games, for a balance of 12v / 3n / 6d (64.29 ratio), but we can imagine that if Melisqus gave him the reins of this premium roster it must not be for nothing. Inforthepain will participate in his 4th Eurobowl, having played twice Skaven (6/2/4) and once Wood Elves (1/4/1). Only 15 games played in Lizardmen for this coach, apparently more used to playing the rosters he directed in previous years. The bet has to be measured once again, but as before, there is not a lot of elements to get out of his chart on a panel of so few games. Second Eurobowl for the Dark Elf coach, after playing 2 Europen. 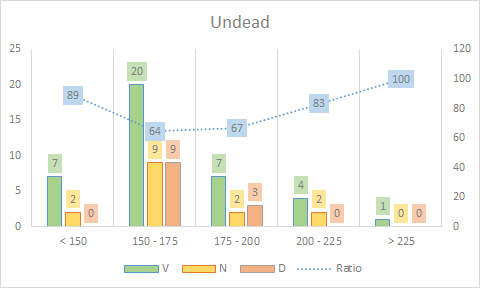 Last year, Coma was playing undead, and seems to have experienced a complicated tournament (0/5/1). If he only lost a match, we can imagine that we hope more points brought back by Tier 1 rosters. He takes the reins of the Dark Elves this year, roster on which he has played only 22 games. He also has little information to draw from his games played against big players on a too small panel of matches. We bet that he will take heart from last year and that he will come more motivated than ever. The introduction was dazzling for the Spaniards. Present in the second edition of the tournament, in 2004, they finish on the podium in 2005 in England, just behind Italy, before winning the Eurobowl 2006, on the lands of the same Italians! Since they are clearly part of the world top, with 4 other podiums (2nd in 2009, still in Italy, then 3rd in 2010, 2014 and 2016). They end up in the top 3 every two years so … Is this a sign for this year? On paper this is a huge team, with 5 players over 200 NAF! Twenty-four caps for this 8, while taking two rookies … it gives an idea of ​​the experience of most Spanish present at the event. The Spanish captain will celebrate his 10th Eurobowl this weekend! Present since 2004, he was absent only in 2014 and 2016! He will be at the controls of the Undead for the 3rd time “only”, since he previously played 4 times Dwarf (8/5/4), Skaven (2/1/3), Amazons (4/0/2), and Necromantic (3/3/0). With Undead, for the 3 Eurobowls played, he has a balance of 8v / 3n / 1d (79.16 ratio)! Although on paper, he has a better ranking in Necromantic, his ratio would make many envious. 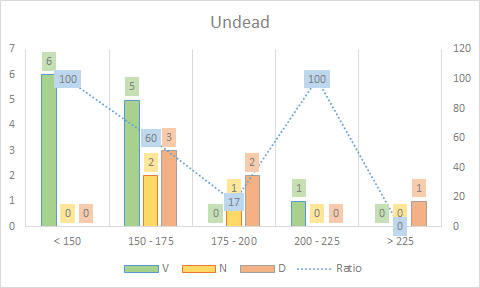 Overall, he is on a record of 39v / 15n / 12d (70.45 ratio) with Undead. We also note that in contrast to many whose stats are falling logically as the level of the opponent increases, Kewan has excellent results against very good players. He has never lost, in 7 games, against opponents over 200 NAF! It will clearly be necessary to count on the Spanish captain, especially coaching such a powerful roster as the Undead. And what is not reassuring for their future opponents is that, on paper, 3 of his team mates are even better! It had been a long time since we saw a rookie in the lists of teams! Donpimpon will play his first Eurobowl, but played the Europen in Porto last year … and when we see his result, we can understand that Kewan have wanted to rely on him – a very big 6/0/0 last year, with a global Wood Elves result of 19/2/4 (ratio 80)! Suffice to say that on paper, it is a sacred customer! His opponents could try to console themselves by saying that he finally played only one opponent at more than 200 NAF (Acryosis in Lizards at the Europen last year) and that he may be missing some experience when the opposition is very strong… or that he has not played Wood Elves in any tournament since the Europen. 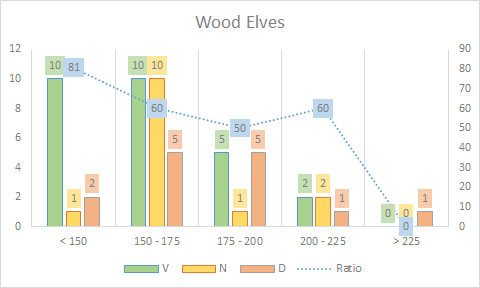 But despite that, to see a Wood Elf player with a ratio of 80 n is never reassuring. Second selection for Beldilucho. After a mixed 2017 edition with the Undead (1/4/1), he was entrusted with the reins of his best roster, since he points to 218 NAF ranking, the 4th national. Playing since 2011, he still managed to pass the bar of 200 NAF on 6 rosters, some particularly difficult to mount, such as orcs and especially the Pact of Chaos. 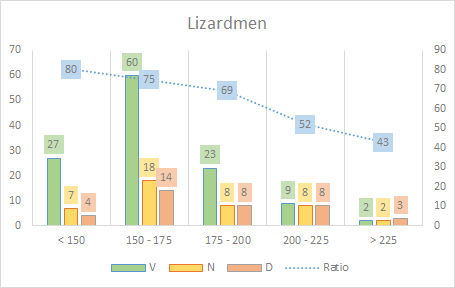 In Lizardmen his record is very good, as he is has lost only once in 22 games! 16v / 5n / 1d, a ratio of 84.09!! To say that Beldilucho will be very complicated to play is an understatement! The world No. 2 with Chaos Pact will celebrate his 4th selection with Humans. He has already twice played Norse (4/4/4) in 2014 and 2016, and will play humans for the second time in Cardiff, after his 3/1/2 of 2017. Also note that he was the only person to defeat Olivier du Lac in Porto, in round 2, which will end at 5/0/1! 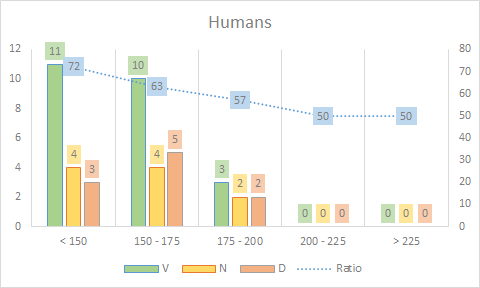 In Humans, from the 10th rank in the world, it has a record of 27v / 6n / 9d, for a ratio of 71.43. It should be noted, however, that he played almost exclusively between 150 and 175 opponents and that his statistics drop drastically as soon as his opponents level up, even if the volume of games played against opponents at 200 NAF and more is not huge. Anyway, Malasnoticias will be a player on which the 8 Spanish will count strongly to get a ranking up to their ambitions. 5th player in the group to exceed 200 NAF on his roster, Noerciux will play his first Eurobowl in Cardiff. Accustomed to so-called “Tier 2” rosters, he should actually be comfortable on the Necromantic. Before the tournament, he posted statistics at 16/5/3 on this roster, for a ratio of 77.08. 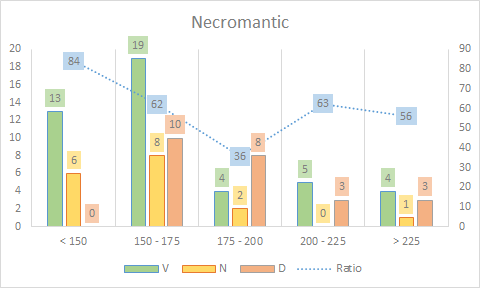 Very nice results, but we can notice that he has not played Necromantic tournaments since 2015 and he has not been opposed to a lot of players of very large levels. This Eurobowl will be a big test for this player, who still displays a very big ratio, all rosters combined, of 67.93! Dark Duke will play his 7th Eurobowl in Cardiff. This active player on tournaments for 15 years does not lack clear experience. On the Norse this year, he previously played Undead (3/7/2), Dwarf (4/4/7) and Wood Elf (4/5/3). 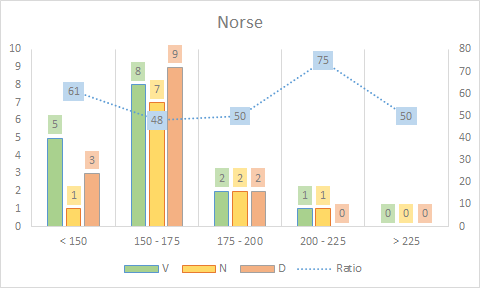 With Norse his overall record is 16v / 11n / 4d, for a ratio of 52.44. It can be noted that he has good ratios, despite the difficulty of being regular on this roster. Without being his best roster on paper, we bet that he will bring his experience to this already very talented group. 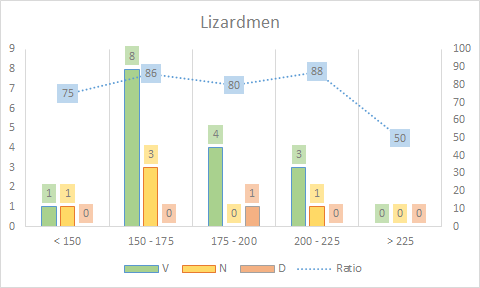 After 4 Eurobowls playing Lizardmen (10/10/4), the coach-at-the-pseudo-the-longer-of-the-circuit will take Dark Elves, a roster with which he finally that very little played. 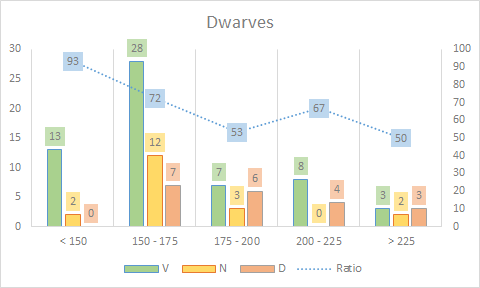 Far from the 258 NAF that he displays from the top of his first place in world Skaven, Duke only records 9 games in Dark Elves, but we can note that he never lost with them (4/5/0, ratio 72,22). There is unfortunately not much more information to draw from his chart, but it is clear that the ranking of this player does not reflect by far his level, and he will be one of the leaders of this group. After his first selection in 2016, Idroj is again selected to coach the Skaven. After a score of 3v / 2n / 1d (66.67 ratio) in this edition, we can note a draw 1-1 against Simon’s Norse. 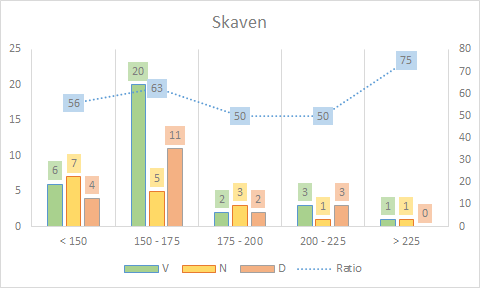 Ultimately Skaven are not his best roster, since it displays, in addition to a NAF ranking of 167.82, an overall ratio of 58.70 (32/17/20). On the other hand, it is interesting to be interested in his chart. We note that despite his statistics that may seem average relative to his teammates, he has very very good results against players of a good level, having lost only 5 games out of 16 against players to more 175 NAF. His opponents would clearly be unwise to underestimate him. Second behind the French at the very first edition of the competition, then the following year at home, the Germans have since become regulars in the upper middle part of the table, finishing on average around 6th place. A 9th place out of 18 last year in Portugal for this selection, which, given its average NAF ranking, seems to have given itself the means to tickle the heights of the classification in Cardiff. One of four selections to be led by a non-player captain (Cheerleader), the Germans have a very big 8 for this year in Wales. Moreover, it is notable that the average would be even higher if we took the rankings to date (but I wanted to stay on the rankings extracted a few days ago, so that all have the same basis of calculation ) since a large part of this team played (and perfected) the HammaBowl 10 days ago. If their NAF average at the time of writing is so very close to breaking 200 we can imagine that it exceeds it with those results. It is rare enough to be underlined – the largest NAF ranking of this team is a dwarf player! Oventa, 9th in tre world with Dwarfs, will play its 5th Eurobowl this year. After playing Chaos Dwarves (3/1/3) in 2012, then Wood Elves (3/1/2) in 2013, he took charge of the Dwarves in 2014 and 2017, and will replay them in Cardiff. On this roster, at Eurobowls, its balance sheet is 6v / 2n / 4d, for a ratio of 58.33. Note that last year, in round 1, his only defeat of the tournament is against the French, in a derby Dwarves, 1-0 against Chavrouze. Overall, nearly 100 matches played in NAF tournaments, for a balance of 59v / 19n / 20d (69.90 ratio). Given the average performance of this roster, we immediately know that we have to deal with a very big player, which will be very difficult to defeat. We also note that it is on a positive balance, even on opponents beyond 175 or 200 NAF. His future opponents are warned. 8th selection for the one who started his international adventure in 2006. Candlejack has a habit of changing roster every year, since he has, until now, played Eurobowls Orcs (2/2/2), Skavens (6 / 2/4), Amazons (1/3/2), Chaos Dwarfs (2/1/3), Lizardmen (4/0/2) and, 2 years ago, Undead for the first time. At this 2016 edition, the least we can say is that he has achieved his Eurobowl, since he ends the tournament on a 4v / 2n / 0d (83.33 ratio). 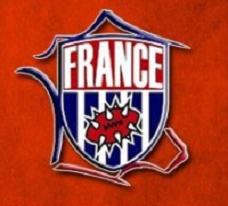 Note that last year, while playing lizard, in round 1 against the French, he was defeated 1-0 by Clement0 and his Woodies. 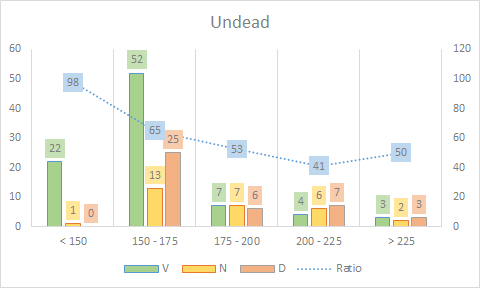 Overall, and 158 games Undead, it comes out of a balance of 88/29/41, for a ratio of 64.87. We note that his stats remain honorable, even against the big NAF rankings. The Germans will be able to count on Candlejack, at the head of a roster he knows by heart, to go for the decisive victories during this weekend. First selection for a “young” player, active on the NAF since 2015. 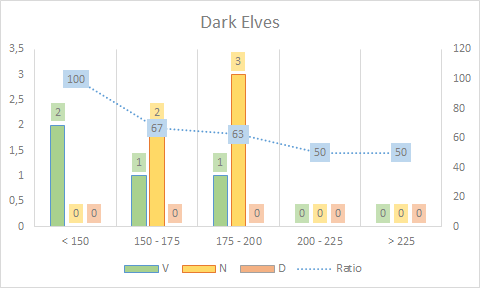 This did not stop him from playing a lot of Dark Elves and quickly progressing on it, pushing his NAF ranking up to 230 even today (the ranking used here takes into account the numbers I took for everyone at the same time a few days ago, so his last 5/1/0 at HammaBowl was not taken into account in the ranking). 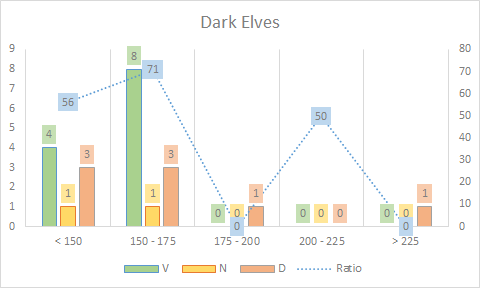 In 64 games played in Black Elves since its debut, it has a great record of 38v / 13n / 13d, for a ratio of 69.53. His graph is in line with this very nice trend elsewhere. Apart from a strange fall against the opponents between 175 and 200, his balance sheets are excellent, even when the opponents are very well ranked. In short, a rookie certainly unknown on the European scene, but who will have a say! His opponents can be wary! He is a veteran who will play Lizardmen in the person of Planlos. Present on the circuit since 2003, he played his first Eurobowl in 2005 and will celebrate his 9th selection this year. 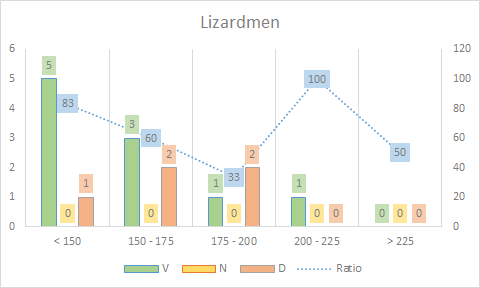 To say that he is experienced in Lizardmen is a euphemism … Of the 8 Eurobowls played, he played only one in black elves (1/1/3 in 2013) and played the other 7 in Men -Lizards, for an overall result of 16v / 15n / 11d (55.95 ratio). His chart shows a very solid player (69 ratio on the 175-200 tranche), even if the balance is balanced logically at the same time as the level of his opponents increases. Overall, it is on a balance sheet of 119/43/37 (70.60 ratio)! Here again, the German team will be able to rely on his experience, both in terms of his roster that he knows on his fingertips than his 8 Eurobowls played. First selection for Miko, active player since 2003. He will be in charge of playing Necromantic for his baptism of fire, roster he knows well since it is his most played roster. From the top of his 58 NAF games, for a balance of 30v / 17n / 11d (66.38 ratio), he has never crossed the road of players over 225 NAF, but he has already had a great experience on the over 175 and for the moment, the least we can say is that it succeeds well. 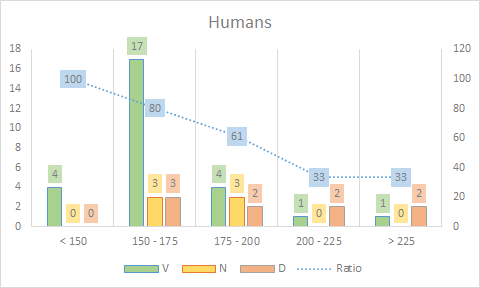 It is even rather rare, but its ratio on the 175 – 200 is better than that on the 150 – 175. A second rookie then, but again, it would be imprudent to underestimate him. 4th selection for the German Wood Elf coach. After two editions with Slann (ed: why, just why docmaxx??! ), quite conclusive what is more (5/3/4) in view of the roster, Docmaxx will replay the Wood Elves released from last year. In 2017 so, he returned a record of 3v / 2n / 1d on the same roster. Aside from the Slann and his 151 (!) 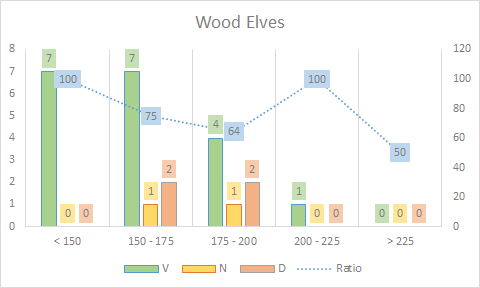 games, the Wood Elves is the team he has played the most in tournament, being currently on a record of 27/14/14 (61.82 ratio). Like others, the NAF classification used here is out of date because he played HammaBowl a few days ago and he took almost 6 points, which brings him closer to the 200 mark. If we look at his chart, we note that despite solid results, he has little experience against players beyond 200 NAF. It remains to be seen if this will hurt him this weekend. Arioso will play his third eurobowl, in Nordics this time, he who played his first two competitions in dwarf chaos (4/1/7). This roster is his 3rd best, but we can imagine that he left the field open to his teammates on the previous two (Lizards and Undead), but also the most played. 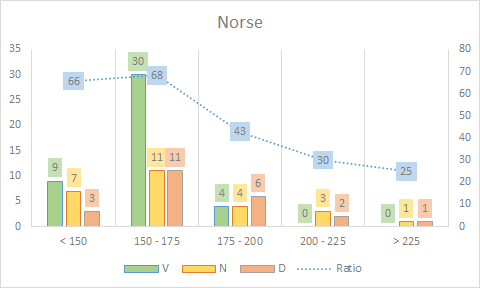 92 NAF matches to date with the Norse, for a balance of 42v / 26n / 23d (ratio 60,87). What may surprise, however, in his chart, excellent up to 175 of adverse rankings, it is precisely the fall in ratios as the level of his opponents increases. Let’s not forget, however, that the Nordic roster is still very difficult to understand and faces some very difficult match-ups. The Chaos Pact coach of this team will play his 3rd Eurobowl, leaving this year his black elves (3/6/3) to Sprinter. This roster is his second most played, although only his 5th best on paper, but we must leave this in perspective of the difficulty of being regular on the Pact of Chaos. 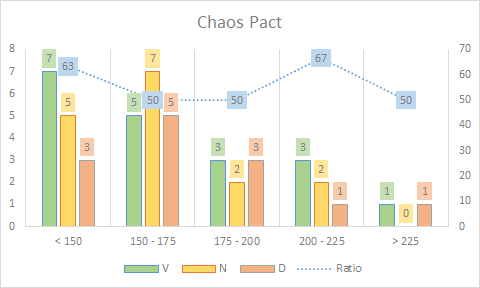 48 games played, for a balance of 19v / 16n / 13d (ratio of 56.25), it should be noted that it has balance sheets, in balance, even positive on the section 200 – 225, which is remarkable for of the Covenant of Chaos. See now if he will push this roster as efficiently as possible to get the points and half-points needed for the Germans to hold their rank!